When I go out and meet people socially, the icebreaker question (after "How are you doing today?") is "What do you do?" Most often, I begin to answer this question with a sigh and a languid gaze to the ceiling. How do I tell these people "what I do?" I'm still trying to figure out how to make my answer short and sweet. I'm a chef, a writer, a butcher, a baker, a candlestick maker? Did mention the cooking classes. Oh, how about the catering? All of that is my personal hang-up. I'm sure I can tell a captivating story about myself that will make people want to gather 'round the fireplace with mugs of brandy or buttered tea. a) the person wants to tell me about the last dinner they prepared and how good it tasted. b) the person wants to tell me about a restaurant where they ate "amazing fried chicken." It's always fried chicken. Never marinated tofu, Brussels sprouts, or baked fish with herb jus lie. ALWAYS fried chicken. Also, people ask me what my favorite foods are or what my specialty is. "Did you just not hear my litany of jobs? I do and make EVERYTHING." Nothing is off-limits. But when it comes to the end of the day and I look at my bare fridge (even though I have 7 different types of cheeses and no bread or crackers in sight) I revert back to my roots. It's been pretty lean around here (most everywhere else, I imagine) and the simpler the better is my mantra these days. I don't do one-pot meals, generally. I'm too modest to prepare expensive, luxurious food items right now. Sorry, porterhouse steaks! I'll see you later, escargot! 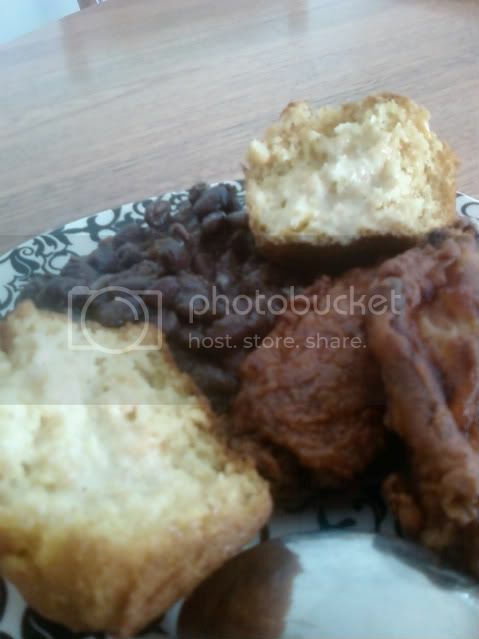 So here we have it: Black beans, fried chicken, and cornbread. Normally, I'd prepare a pot of pinto beans complete with ham, bacon, and some smoked turkey wings. It's the cassoulet of the Southeastern U.S. But I didn't make them this time. Christy at Southern Plate did. Please check her out! Someone gave me a bag of dried black beans and a bag of chicken wing flats (the part of the wing that isn't the drum). How frugal can you NOT be when people are GIVING away food?! Once again, no real recipe here. I soaked the black beans overnight (12-15 hours, approximately) and rinsed them throughly before adding them to a large stock pot. I added 10 cups of water and put the beans on high. While the beans were beginning to cook, I cooked the mirepoix (celery, carrots, onions) with the butter until everything was soft and translucent. To this, I added the white vinegar, and a few dashes here and there of the oregano, thyme, and cumin. I used whole seeds and freshly ground cumin. I added this mixture to the now simmering beans and stirred. I let the pot cook for an hour. I added more oregano, thyme and cumin after tasting a few of the beans. I also added salt. How much salt? I don't know. Maybe 1/4 cup, a small palmful. And my hands are not that big. After another hour, the water had been cooked away and the beans were thick and flavorful. You'll be seeing these beans later on in the week. I hope you're impressed...Stay tuned. In a large bowl, whisk together orange juice and vinegar until combined. Add chicken pieces and enough water to coat and soak 1 hour in the refrigerator. Chicken should be completely submerged in mixture. In a large pot, heat oil until a deep-fry thermometer reaches 325 degrees F. Line a sheet tray with paper towels and/or a wire rack. In a large bowl, whisk together eggs, Sriracha and black pepper. In a plastic container (like Tupperware), put a lid on and shake together flour and cornstarch. Drain chicken from brine and dip in batches first in egg mixture then shake in flour mixture to coat. Set on wire rack to let coating sit for 10 minutes to set. In 2 batches, fry chicken until golden brown cooked through, 10 to 12 minutes, depending on the size of the pieces. Remove from oil to drain on paper towel-lined sheet pan. Put butter in a cast-iron skillet and place in the oven. Combine the cornmeal and flour, then mix in the egg and milk. Add water slowly, until the mixture is pourable (like thick pancake batter). Stir in the corn kernels. Take the hot pan from the oven, pour some of the melted butter into the batter, then pour the batter into the hot pan. Place back in the oven and bake for 20 to 25 minutes, until the outer crust is golden brown. Serve hot, with whole, cold butter. ok that plate of food looks like a little slice of heaven! I know what you mean about the what do you do question. Its been interesting for me too since I quit my "real" job. Oh lord, Nikki, you know whats good thats for sure! You know what is good! You are one of the few people I know that I wouldn't think anything of picking you up from one of the finest restaurants around and taking you to my house for some bread pudding made with leftover biscuits! I love how real you are!! Like Grandmama says "I reckon she's jest good people" . 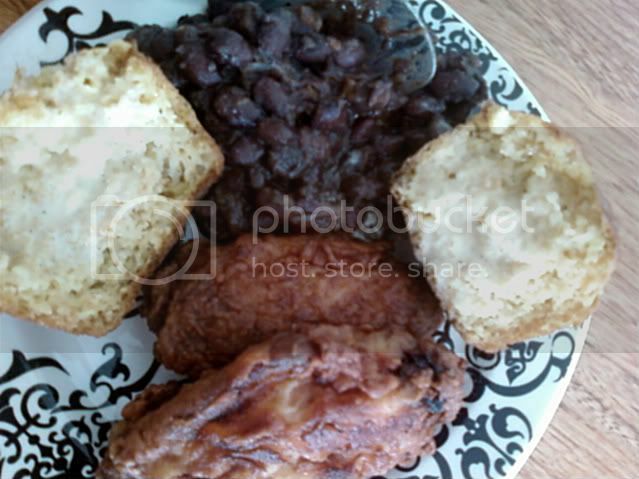 I'm making Pinto beans for dinner and I'm adding your cornbread. My mouth is already watering. This is maybe the first recipe for fried chicken I've seen without buttermilk. Orange juice and apple cider vinegar... NOW you have my attention. This is DEFINITELY comfort. You're just missing a glass of kool-aid...red! I just watched your video and I was just grinning like a cheshire cat!!! Whoohoo! I KNOW HER!!!!! But oh my, what was that cut of meat you were using, the one that looked like a steak? and WHAT were you marinating it in and then how did you cook it? I LOVE STEAK but I NEVER get steak because I don't have a grill!!!! Have you ever successfully cooked a good steak in or on the oven? I'm still grinning!!! Nikki's on tv!!!!!! Kat: It was so simple and so good. It's food like this that de-stresses me and makes me feel good about having 99 jobs. Christy: You are just too good to be true! I'd love to come over for some bread puddin'! No matter how big my britches get, I have to remember where I came from! Terri: Please tell me how it turns out! Adam: I think I might try that. Seriously. "I'm Awesome, and who are you?" Buttermilk is good and all, but orange juice tastes better. It can tenderize just as good. I know you're busy getting it together. Take your time. D: O.M.G. For real? What you know 'bout red drink? I'm so glad you liked the video!! Ha! Thanks for the cornbread recipe, I've been wanting a traditional recipe. Growing up I want a huge fried chicken fan. Now its the ukltimate comfort. And even better home made. I hate it when people ask me what I do too, because we do so much. Sunny: Oh, don't you worry...as soon as I hear you're gonna be near here, you'll be getting one of those e-vite thingys from me. Trust. Courtney: I always feel bad after I fry food, but not this time. This chicken was too good to have any regrets. I was asked no less than four times today what I do. I need to remember to use that, "I'm Awesome" line from Adam. Everything about that looks good! I am feeling drawn towards fried chicken for my next Southern cooking experiment! Haha, I love you. You're so funny. People always tell me what they cooked, not where they ate. And you know what they always cook? Chicken. It's always something really boring, too. "I marinated it and then I grilled it" and I'm supposed to be impressed? :) Okay, I sound mean. However, your chicken and beans sounds really comforting and delicious. I love Sunny! I bet your fried chicken is to die for!! 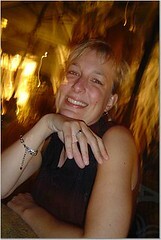 How fun that I found your blog while I'm down south visiting my daughter in Charleston. Perfect. Your food looks awesome and I loved the video of you cooking on TV. I've always made my buscuits with butter flavored Crisco, but now I'm dying to get home and try BUTTER. How do you answer what you do? You're doing a million and one things. You're amazing and the food is too! Never thought of using sriracha for fried chicken! Next time. And I'm with you on the "what do you do" question. I don't have as many hats as you do, but it's hard to narrow it down when you eat and breathe all things food. foodycat: Oh, I can't wait to see your experiment. I must return the favor and do some classic English food. I'm dying to to Yorkshire pudding. emiline: What's up with the chicken? If you want to impress me, tell me about a pig you roasted in the ground with ti leaves or your meal at El Bulli :( And you're totally not mean. We're just sooooo past chicken. shari: It was really really good. As expansive as my vocabulary is, I can't think of any better adjective to describe it! laurie: Oh, I hope you had a great time visiting your daughter. Well, I hope you get a chance to come back and visit my little blog and tell me about your butter-filled biscuits (which are TOTALLY worth it). prudy: Thank you! I admire you as well! kendra: I'm a Texas Pete girl, but I love sriracha just the same. Eating and breathing food is what sustains us, I reckon. Chicken wings are not my first choice when eating chicken but they sound very crispy. From one Southern NC gal to another, this is nicely written!! And I'm all for fried chicken and cornbread! It doesn't get batter (lol better?) than that!! I look forward to reading your blog!